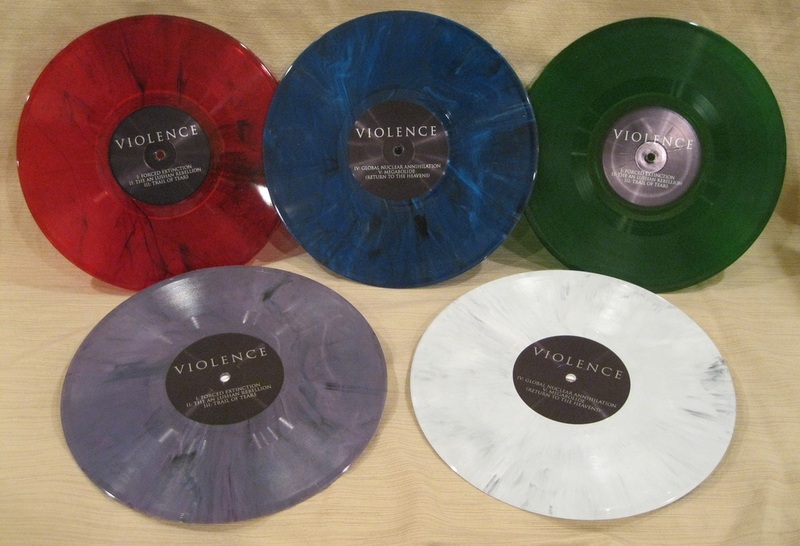 At $10 a pop, Fister's Violence is practically a no brainer and an easy way to begin building a vinyl collection. Late last year, the Saint Louis doom trio announced their partnership with Ohio-based Gogmagogical Records as the label's first release and with a few sweet details: the EP would be available in five colors, limited to 500 copies collectively and 100 per hue. As much as I love vinyl, I normally cringe at the idea of paying over $20 per album, yet alone $50 for five records holding the same exact track listing (in spite of aesthetic differences). But despite my reservations, I scooped up all five and immediately loved the splash of color and unique cover art exclusive to each variation. Violence's packaging is nominal at best (but made well) and looks a bit like a DIY job, which scores points in my book. Examining the jacket closely, you'll notice the cover art is a simple print job atop bare cardboard that, when placed firmly between the fingers, has a grainy texture and lacks the smooth, glossy coating of a sleeve double or even triple the price. But don't let that deter you: regardless of release, Gogmagogical Record's goal to deliver a quality product in any format still stands here. Really, there's no reason to complain when you have a new album sitting on the turntable. Moving to the record itself, the finish generally rivals anything else in the industry, but the edges can look jagged, if not slightly imperfect. At this price point, though, there is little one can do to combat superficial blemishing, especially if sound is the primary focus and avoids being compromised by aesthetic detail or recycled plastic. Compared with another recent purchase, Riot's Immortal Soul, Fister's album sounds leaps and bounds better and exhibits none of the wavy, frequency bending tendencies characteristic of some colored vinyl. Aside from tiny imperfections, I must admit I'm thoroughly impressed with Fister's latest vinyl and hope to see them work with Gogmagogical Records in the future. A quality product at a budget price indicates a focus on the fans and the music itself--something I completely respect when running a label is extremely tough in this day and age. Up next on Gogmagogical's roster is Cold Blue Mountain's self-titled debut, so expect to see that featured in all its sludgey glory in a few short months. My favorite cover art. Look at that detail! My favorite cover as well! RE: the jagged edges, that part didn't bother me at all but that might be because it's rare that a record makes it to my house through the post office without any creases/dents in the sleeve anyway.